When your thermostat is set to AUTO, your furnace fan should blow only when your furnace is in the middle of a heating cycle. But if your fan runs constantly, regardless of whether your furnace is heating, that’s not normal. We know. That’s a lot of possible problems. But don’t worry, we’ll walk you through some troubleshooting steps so that you can pinpoint your issue. We’ll also let you know when you’ll need a professional to solve the problem. Live in the Phoenix area and need a tech now? Just contact us and we’ll send a professional over immediately. First off, let’s confirm that your thermostat is set correctly and isn’t calling for continuous heat or forcing the fan to blow non-stop. Follow these troubleshooting steps to do that. 1. Set your thermostat to a temperature that’s lower than the current room temperature. This shuts the furnace down and prevents your thermostat from calling for more heat. If the furnace was in the middle of a heating cycle, wait 3 to 4 minutes for the blower fan to stop running. Did your furnace fan stop blowing? If so, it’s likely that you’ve set your set temperature too high, causing your furnace to heat continuously as it tries to reach that temperature. Another issue that could cause your furnace to heat constantly is a house that isn’t weatherized properly, allowing cold air to enter the home as hot air escapes. If your furnace continues to heat constantly but can’t reach your set temperature, have a professional inspect your system and home and provide possible solutions. 2. Make sure your fan is set to AUTO and not ON. If your fan is set to ON, it will run continuously, regardless of whether your furnace is heating or not. Tip: Avoid setting your fan to ON, it wastes money because it forces the fan motor to run constantly. If your furnace fan is set to AUTO and is still running, then move on to the next section. 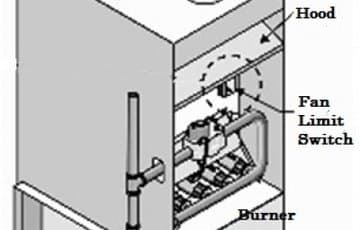 Your fan limit switch is located directly under your furnace hood and controls when your furnace blower turns on and off. A probe inside the switch monitors the temperature of the burner assembly to turn the fan on once the burners are hot and turns the fan off once the burners cool down (when the thermostat stops calling for heat). 1. 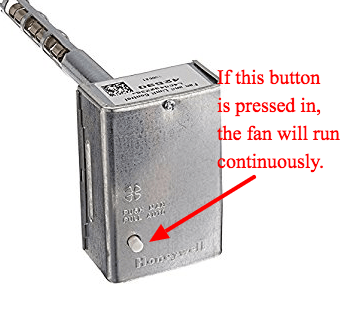 Locate your fan limit switch and check to see if the white knob (see pic below) is pressed in. If so, your switch is set to manual override, or “always running” mode. 2. 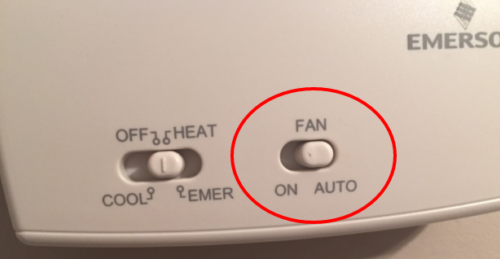 Pull the white button out to reset your fan limit switch to AUTO. This will cause the fan to automatically turn on when the furnace is heating and shut off once the call for heat stops. 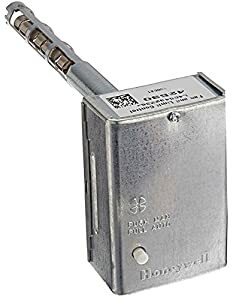 If your fan limit switch was already set to AUTO (not pressed in), then you most likely either have a problem with your thermostat wiring or the fan limit switch is bad. Unfortunately, you’ll need a professional to fix both of these problems. If your furnace fan is still running non-stop, we can help. Just contact us and we’ll send over an experienced Phoenix tech who can fix your furnace fan problems!